We hope you are having a happy hump day. We regret how little we have posted the last few weeks. Work obligations and winter colds temporarily got the better of us, but we’re back and darned pleased about it too, as there is so much to delight in, in our fair little berg. When grey skies loom overhead, it can be tempting to remain indoors, but too much hibernating can exacerbate those winter blues. It is good to get out now and again. Winter walks are an invigorating restorative and, afterwards, you can reward yourself with a pint to maintain that rosy-cheeked glow. 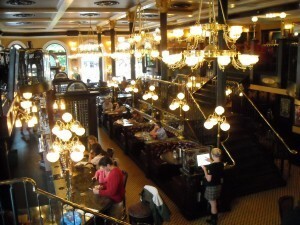 Victoria is home to a plethora of pubs, some humble, some high-end, and many in-between. 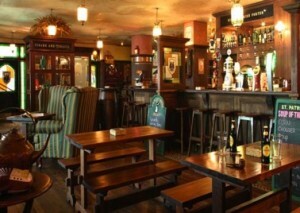 Bard and Banker Pub, which we visited recently, would constitute high-end. Dining here is undeniably expensive (fish and chips ring in at $25.00, the burger is $16.50), but the surroundings are so lovely (casual, yet elegant) and the service so welcoming, we were seduced in to splurging. After all, Monty feels quite at home here with his snifter, cigar, and smoking jacket (we daresay he fit right in, ensconced between gleaming brass fixtures and leather booths). Bard and Banker would not have merited a mention had the food been disappointing as we do not equate homey pub sustenance with that of fine-dining (sorry gastropub movement) but sometimes you have to give credit where credit is due, and, once in a while, for the right kind of ambiance, it is worthwhile to splurge a little. And one has to be pragmatic that restauranteurs retain a slim enough profit, sometimes they have to charge a little more to retain quality. We sampled the aforementioned fish and chips with ale batter and we were not disappointed. The chips were hand cut and crispy, the ale-batter was ethereally light and the halibut encased within was moist and flaky. Our dining companions liked their burger and rosemary roast chicken (you can order a half or an entire chicken at B&B). The chicken is brined and rotisserie roasted and comes with a choice of sumptuous sides such as braised red cabbage with apple, garlic-rosemary mashed potato, and/or roast squash with cinnamon butter. As of this writing, we did not sample the appetizers but, if one were light of wallet but in need of a night out, you could order a cup of chowder ($6) and a plate of parmesan fries ($8) and a pint (there are daily drink specials) and I daresay you might be just as happy. For dessert, we recommend the sticky toffee pudding (stay away from the fridge-cold and stingily portioned apple tart). We know that diners and drinkers can have a variety of moods and varying budgets and we intend to give you a myriad of options in the coming weeks. We’d recommend Bard and Banker for a date night or a night out with friends when you feel like a little something with a little more opulence. We were delighted that the particular corner of the pub we were seated in had no televisions visible (one of our own pub pet peeves) and was spacious, yet quiet enough to facilitate conversation. 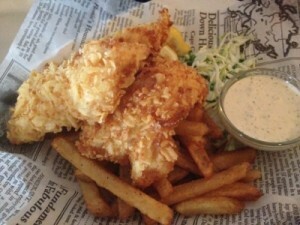 We noted when we did a bit sleuthing on-line that many bloggers rave about Bard and Banker’s potato chip crusted fish and chips (they offer two versions). It might be worth sampling this novel item (crispy potato chips would add a pleasing crunch to your fishy feast). 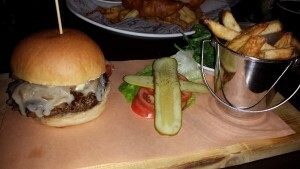 Have you been to Bard and Banker? If so, what did you think? Visit our Facebook or Twitter pages and tell Uncle Monty all about it. We’ll see you at the pub! Love Monty and the whole gang at H.A. H.Q.